Modern women may have gained much equality and independence in social, political and economic terms, but is a woman’s spiritual potential as great as a man’s? We asked Jetsun Chimey to explain the Buddhist view. Your visit to England this year  marks the first time a woman master in the Tibetan Buddhist tradition has ever taught here. Why are there so few women teachers? I think the two primary reasons are karmic and cultural. Karma is a factor in deciding gender, and then the differences in the way men and women live–their different roles–are the products of certain kinds of karma. On the cultural side, in Asia there were more men who wished to put their effort into spiritual practice than there were women, and that is why there were fewer nuns than monks. But other than this, there are no reasons that I am aware of. Certainly there are no arguments for this in the teachings themselves. Could you explain the karma of being born a woman? I really don’t know what the karmic causes are to be reborn as a woman; I have never seen any explanation of the karma of being born a woman in the scriptures. But personally I think individuals have a special karmic connection to their first life of spiritual practice, so if a person was a woman in their first life of practice, they might choose to take rebirth as a woman. I know there are prayers in which we pray not to be reborn as a woman but as a man. Most of these were written at a time when the life of a woman was very hard, and I think that is the reason people prayed for rebirth as a man. Yes, and in the Mahayana too, but the Vajrayana doesn’t say that. Why is it more difficult according to Theravada and Mahayana? Women are said to have more desires, all sorts of wild thoughts, and are also very prone to doubt. Buddha said that doubts and desire are unhelpful for religious practice, and in the Theravada and Mahayana teachings, he pointed to them as obstacles. So women are at a disadvantage on the spiritual path because they have so many emotions, and emotions are seen as defilements? Yet in the Vajrayana almost the opposite is true, and women are seen as a symbol of wisdom. Fundamentally, men and women are the same–they are both human beings. However the masters have found that there is a difference between their minds. 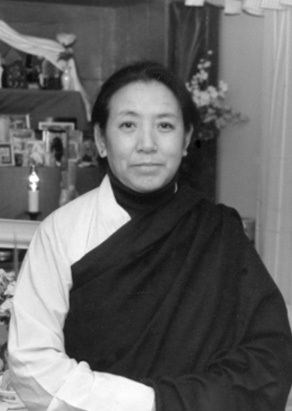 Women have very sharp minds; they are actually sharper than men, which is why in the Vajrayana, the path which works directly with the mind, women represent wisdom and men represent method. Often a woman will have thought through an idea many times, long before the idea has even struck a man. This is something I have noticed when comparing my husband and myself. In the Theravada and Mahayana, on the other hand, there are many examples where women are shown to be bad. This view is also sometimes reflected within the culture. In India, for example, women have a lower status than men. As most of Buddha’s disciples were male, he used the example of beautiful women to demonstrate impermanence. Monks were trained to consider that a woman’s beauty is only skin deep, and however beautiful she may be when she is young, one day she will grow old and ugly. This is a method for reducing sexual desire, and was taught by Buddha because he felt that sexual desire was not helpful for spiritual practice. He also taught another method, called ‘sealing the doors of the senses’, in which the beautiful woman’s body is skinned, mentally, and monks consider how ugly and repulsive it is inside as they ‘look’ at the pus, blood, intestines and so on. Using these examples, Hinayana and Mahayana monks who had taken the vow to lead a life of renunciation, would purify their minds. The point here is not that women themselves are ugly and impure—if Buddha were to teach a group of nuns, he would use the same example in reverse and tell them to scan the body of the man they desired. Men and women are both human, they both come from the mother’s womb, there is no difference between them. This is my view, it is not something I’ve been told. Buddha taught all sentient beings. There is nothing in the scriptures to tell us that he taught men rather than women. So to summarise, from the Theravada and Mahayana points of view, both men and women are basically the same–they have emotional and intellectual defilements which need to be purified–and the difference between them is one of degree; but from the perspective of the Vajrayana, there is a subtle difference between the minds. That’s right. In the Vajrayana, especially in the Sakya and Nyingma traditions, there are dakinis who are considered to be spiritually more advanced than men. I’ve heard that at some levels in the Nyingma, you cannot get enlightened unless you have a spiritual consort. A Vajrayana monastic still has to keep all the Mahayana vows; it’s only at very high levels that a physical consort might be taken. Normally a physical consort isn’t used, instead a mental consort is visualised. Now let’s turn to everyday life. Modern women often feel an enormous conflict between wanting a husband and family, and having a career. Even once they have children, many women still feel they want to be independent, have a job, and become somebody in their own right, and are not content with being a wife and mother. The first thing I’d like to say is that all western women are independent compared to women in the east. I think the conflict you mention depends on the individual’s mind. If you have a big heart, the heart of compassion, you can do anything. If you don’t have a big heart, although your mind might want to achieve many things, physically they won’t work out. The mind is very tricky, you know, it wants to do all kinds of things; the mind can think up goals which are far beyond the bounds of possibility. So if you expect too much of yourself you will never achieve anything; what you can manage personally, as an individual, depends on your mind. I was a nun, then I married and had five children, but I didn’t plan it that way–even now I don’t make plans. Then suddenly, although I had never thought of it before, H.H. Sakya Trizin told me to teach, and so I did. For women who have a supportive husband it’s a little easier. My husband is very good–he is not jealous at all, whereas some husbands have a very jealous nature. I am not jealous of him either and we trust each other completely. This makes it easy for me to travel and teach, otherwise if my husband were a jealous person it would be quite difficult. He has many good qualities and supports me completely. I think that women who want both a career and a family have to find a balance and give equal time to each. It’s easier if your husband supports you, and more difficult if you both have a career, because then life becomes rather hectic. And remember that children don’t stay small for ever, they grow up and don’t always wait until they are 18 years old before they leave home. Some women become anxious and feel they can’t manage, but if you really want to do it, you can. But always keep a balance. For example, I teach and I have a full-time job. I have to work because we bought a house and we have to keep up the mortgage. On top of that children are quite expensive–especially boy’s sports clothes! So I have a full-time job, teach part-time, and spend weekends with the children. As I am a Dharma practitioner, I also do my practice. Practice actually helps you to discipline yourself. A family, a career and everything else can be exhausting, and to fit it all in as well as your practice you might have to skip some sleep once in a while. At first it can be hard to get up early in the morning to practise because you’re not used to it, but by the second week it’s already a little better, and after a month you’ll find it’s much easier. If you find you are too exhausted to do everything you have to do, you should watch your diet. Eat smaller quantities, eat less meat, and don’t drink alcohol. Drinking alcohol is bad for a religious practitioner, or for any human being come to that. Parents may have started a spiritual practice and wish to bring their children up according to spiritual values, yet their practice may not be firmly established and their understanding may not be mature enough for them to do this well. What advice do you have? Start with a very simple teaching and a very simple practice. Doing long practices or retreats is difficult if the children are too young, though if you are rich you can hire a baby-sitter! So wait until the children are older before committing yourself to intensive practice. You can bring the children along to simple practices, and they can learn something too. It will give them some understanding as to why their mother is part of this religion and they won’t think it’s so strange. But actually they can’t understand until they are four years old anyway. So, do a simple practice, not a strict one, and every so often do it with your children. I have heard some teachers say that having children can in itself be a distraction from spiritual practice. When you look at the world, you will realise that whether you have a child or not, there are plenty of distractions. You may have to start with a simple practice and wait until your child is older before doing longer retreats, but the important thing is to have the aspiration to follow the spiritual path, and to be dedicated to it from the beginning. Then, somehow, you will be able to do it. However if you just have a vague wish that it will happen, without really pursuing it, then of course nothing will happen. Buddha taught that we should regard all beings as equal. As you know, modern women demand equality with men usually in terms of jobs, income, social status, decision making and so on. How do you view the way we manifest our basic equality with men? and to bear fine children. These qualities don’t come so easily to men. But men are better able to keep things to themselves, this is one of their qualities. For example, if a man is told something in confidence he won’t feel compelled to speak about it with others, whereas women tend to want to share it. Western women have been brought up very differently to Eastern women, and as you said are much more independent. Perhaps as a result of this, some find it difficult to relate to traditional practices such as devotion. How can we relate to such practices and how could we adapt them so they fit the way we are? I think it’s important to remember that there are different kinds of teacher, and also that you go through different stages in your spiritual life. When you take spiritual vows and precepts in the Mahayana, you regard the master as a teacher and guide, but when you enter the path of Vajrayana it’s essential to realise that there is much more involved. The Vajrayana master is not simply a teacher, or a person, but is seen to be none other than the true presence of Buddha himself. So as we find ourselves at different stages along the path, we have different needs and accordingly follow different requirements. What is required, above all, is a measure of responsibility for oneself in order to begin the spiritual path in the first place. You can study some of the important texts, such as the Fifty Stanzas on the Spiritual Teacher by Arya Shura, which explain how to relate to a teacher, but long before you enter the path and accept a teacher as your teacher, and long before you learn to develop devotion, you have to think very carefully about whether or not you want to enter the path at all. Nobody is asking you to do it or indeed not to do it; it is up to each and every individual to decide where their interest lies and where they wish to put their effort. If you find that spiritual practice is good for you, then examine very carefully what it entails, and only after that should you decide whether or not to enter the path. Once you have entered the path, especially in the Vajrayana, you must look for a teacher who is worthy of your devotion and respect, and having decided to follow the direction and teaching of a master, then you must actually focus on this in a dedicated way, otherwise you will never accomplish the path. It is important to remember that your interest in a teacher, your dedication to a teacher, and the state of mind in which you feel pleased with a certain teacher, should not be confused with similar experiences in relationships with your parents, friends or relatives. The nature of the teacher-student relationship is completely different. Normal human relationships are based on a certain attachment and desire, whereas the relationship between student and teacher should be free of attachment, desire and craving. That’s very important. You should learn to cultivate that. If you do, then whatever devotion you develop will be meaningful, but if you don’t, and have lots of thoughts about your teacher, then it will be hard to accomplish anything at all. So if you take the initiative of thoroughly examining the path and the teacher at the outset, this will help you develop a healthy and beneficial relationship with your teacher. Whether you are a man or a woman, you should always keep the Buddha, Dharma and Sangha (the Triple Refuge of Buddhism) in mind. In this way, you will progress throughout your daily life. At the same time, try to learn patience in everyday life. Patience makes everything much smoother. When your mind is calm, other people are more relaxed. If someone else makes a mistake, we are all likely to blow up. Instead, remember that everyone makes mistakes, and that you can make mistakes too, because you are only human. Always be kind to everyone, in every way you can, physically and mentally. Whatever you do, it is your motivation that really counts. Without good motivation, even if you do things that are generally considered to be ‘good’ they won’t be very beneficial because your motivation is not as good as your action appears to be. So for example, smacking or scolding a naughty child, because nothing else works, but with the good motivation of wanting the child to have a better life, will actually help him. However if you speak or act out of anger or hatred, then it won’t benefit the child at all. It all comes down to motivation: that’s something you should never forget. This page was last edited on 13 April 2018, at 08:03.